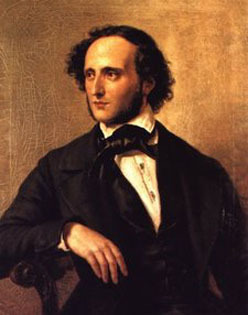 Felix Mendelssohn is one of my favorite composers. He was a German composer in the early Romantic era. He is known for great music that flows perfectly with so many beautiful melodies. Besides being a composer, he was also a pianist, organist and conductor. Felix Mendelssohn was a true genius child prodigy in music. He was not just a prodigy in his virtuosic piano playing, but in being a composer. It is not just that he composed music in his early teens, it is that he composed so many great mature pieces as a teenager. Mendelssohn's Octet For Strings in E-Flat Major is one of the greatest chamber music pieces ever composed. Mendelssohn composed this great piece at the age of sixteen. As a teen he wrote many of his string symphonies [for only strings] and at the age of 15 Mendelssohn wrote his first full orchestral symphony in C minor [his symphony #1]. Mendelssohn composed twelve string symphonies and five great symphonies for full orchestra. He also composed many great pieces for piano and organ and concertos and overtures and chamber music pieces. His well known violin concerto is one of the greatest of all the violin concerti. If there is one word I had to use to describe Mendelssohn's compositions it would be melodious. That is why modern day audiences love to hear any piece by Felix Mendelssohn. To demonstrate the luxurious melodic beauty of a Mendelssohn piece check out: the first movement of Mendelssohn's Symphony #3 in A-minor, known as the "Scottish"; the pensive, solemn Andante movement of his Symphony #5 in D-Major, known as the "Reformation"; his beautiful concert overture, "The Hebrides"; the romantic movement from his piano concerto in D-minor; and his exquisite Overture To a Midsummer Night's Dream. After listening to this beautiful music, I think you will understand why I say Felix Mendelssohn composed some of the most melodic pieces ever. Note: in the Mendelssohn piano concerto, you will hear at first the bridge from the first to the second movement and the actual 2nd movement begins at the 19 second mark. Please turn up the volume and enjoy some music by Felix, the melodic cat! If asked the familiar question, "If you could have lunch with someone famous, who would it be? ", my answer would surely be MENDELSSOHN! What an amazing, and far too short, lunch that would be!! Boy, would I ever love to pick his brain. Yes, I agree with you Pamela--I was thinking that to myself out of all the classical music composers who would I like to meet, and the answer was also Mendelssohn.